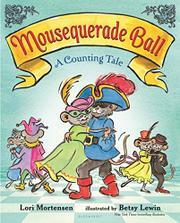 From one to 10 and back again, the mice get ready for the ball. One lone mouse begins preparations by striking a fire in the grand fireplace. Two others scurry around with brooms to swish the castle clean. “Three fine mice in black-tie suits / tighten up the strings of their thumb-strum lutes.” It is time to don a mask and waltz at the Mousequerade Ball. Eight lords twirl their walking sticks with haughty importance, and nine buccaneers tip their elaborate, feathered hats in debonair bows. However, the 10 ladies, dressed in elegant finery, suddenly let out a terrified gasp. Who has arrived at the door but a…CAT! (Alas, the dramatic double-page close-up of the cat’s face is sadly, distractingly bisected by the pages’ gutter.) Mortensen frantically trips back down the number line as mice scatter to hide: “Six eager mice race beneath a rug. / Five plump mice squeeze into a jug.” But the last mouse realizes that the cat has come for the same reason as everyone else. She proffers her little paw, and they dance the night away. The spry toes of Lewin’s tiny mice glide along the text’s sprightly beat, her signature thick, flowing black line delineating features and finery and lending the rodents personality and movement.